NOTE: This page is now obsolete. Much of the information contained here is out of date, and links have changed or otherwise become invalid. I'm leaving it up for historical purposes. UPDATE: March 17, 2001 - Here is the new 2001 spotter's map. Emergency Services has revised the map and made some changes to the spotting points. This map is still current for 2002. A word of caution: While the storm spotter's net is an extremely valuable resource and is very effective at providing early warning of dangerous weather conditions, information from the spotter's net is raw data that has not yet been processed by the experts to get the 'big picture'. DON'T ASSUME that it is safe to go out because none of the spotters sees anything dangerous. 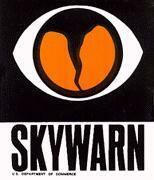 If you hear sirens sounding, or if the local broadcast media are advising that you take cover, DO SO!!!! Better safe than sorry. Click HERE for a Lincoln weather RADAR image. For information on becoming an amateur radio operator (ham) and becomig a spotter, contact the Lincoln Amateur Radio Club. Note: We DO NOT 'chase' storms; we sit on high watch points throughout the county and watch the clouds. If storm chasing is what you are after, check out the NEVIT page. This map image was scanned with an HP Scanjet Plus monochrome scanner connected to an IBM PS/2 Server 95 9595-0PT, 200 MHz MMX Pentium, 64 MB RAM, IBM 9517 17" Trinitron monitor. Total system cost, less than $100 surplus. Image processing/editing was done with Corel Photo-Paint 7 running under Windows NT Workstation 4.0 on the same computer. No hardware that is not considered 'obsolete' was used in creation of this image.